Phagocytosis is the process where a cell (phagocyte) engulfs a solid particle to form an internal compartment called a phagosome. The membrane of the phagocyte forms a crater shape around the particle that is to be phagocytised. Within the phagosome, the particle can then be degraded. In the immune system, it is a major mechanism that the body uses to remove pathogenic material. In this article, we shall briefly review the process of phagocytosis, highlight major phagocytes in the immune system and discuss the clinical relevance of phagocytosis. Neutrophils– these are abundant in the blood and are dominant in acute inflammation. Macrophages– these are closely related to monocytes in the blood. They live longer than neutrophils and are the dominant cell type in chronic inflammation. Dendritic cells– these cells are involved in the amplification of specific immune responses. B-lymphocytes– these cells require some phagocytosis to transform into antibody producing plasma cells. Further information on phagocytes can be found here. Resting phagocytes become activated by inflammatory mediators (e.g. bacterial proteins, capsules, peptidoglycan, prostaglandins, complement proteins). The result is that they gain the ability to leave the capillaries and enter the tissues towards the site of infection (chemotaxis). Phagocytes switch to a higher energy level. This usually involves rearrangement of the cell cytoskeleton and swelling of the cell (caused by calcium and sodium ion influx). Phagocytes also produce pattern recognition receptors (PRRs) which recognise and bind to pathogen-associated molecular patterns (PAMPs). PAMPs are components of pathogens and can include molecules like peptidoglycan and lipopolysaccharide (LPS). This is the directional movement of the phagocyte towards a chemical attractant (chemotaxin). Chemotaxins include bacterial products (e.g. endotoxin), injured tissues, complement proteins (C3a, C4a, C5a) and chemical substances produced by leukocytes (leukotrienes). The process of chemotaxis is usually coupled with activation. Fig 1 – Diagram showing how the chemokine concentration gradient affects the direction of chemotaxis. 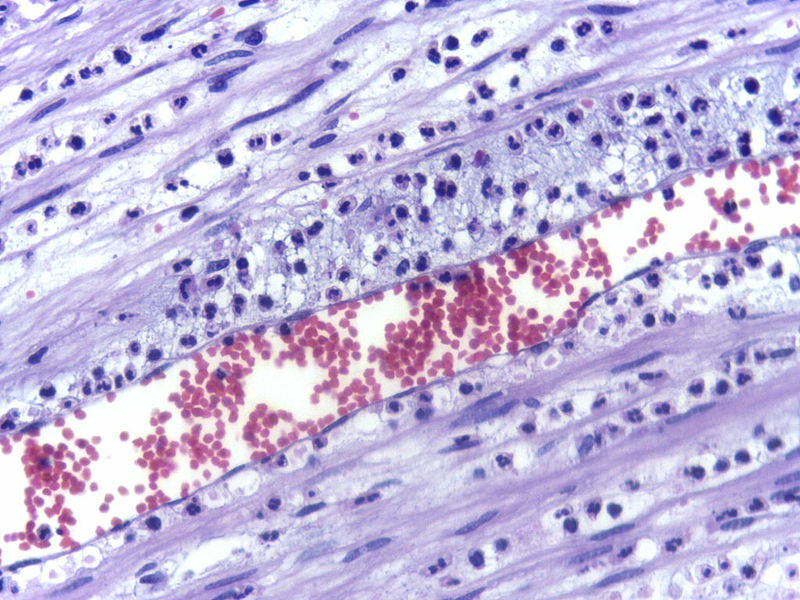 In margination, leukocytes assume marginal positions in the blood vessels. They stick to the walls of the venules and roll along them until they become firmly attached to the vessel wall (adhesion). At this point, they begin to move out of the vessel. Fig 2 – Electron micrograph demonstrating margination of neutrophils in acute inflammation. This refers to the process of the leukocytes ‘digging’ their way out of the venules. They produce the enzyme collagenase which digests the basement membrane at their attachment point; allowing them to escape. This can either be due to the innate recognition of PAMPs by the phagocyte through its PRRs (unenhanced attachment) or the phagocyte can attach itself to the microbe through antibody molecules (IgG) or complement proteins (C3b, C4b). This is known as enhanced attachment, and it is much more specific and efficient than unenhanced attachment. After attachment, the phagocyte internalises the microbe into a phagosome. 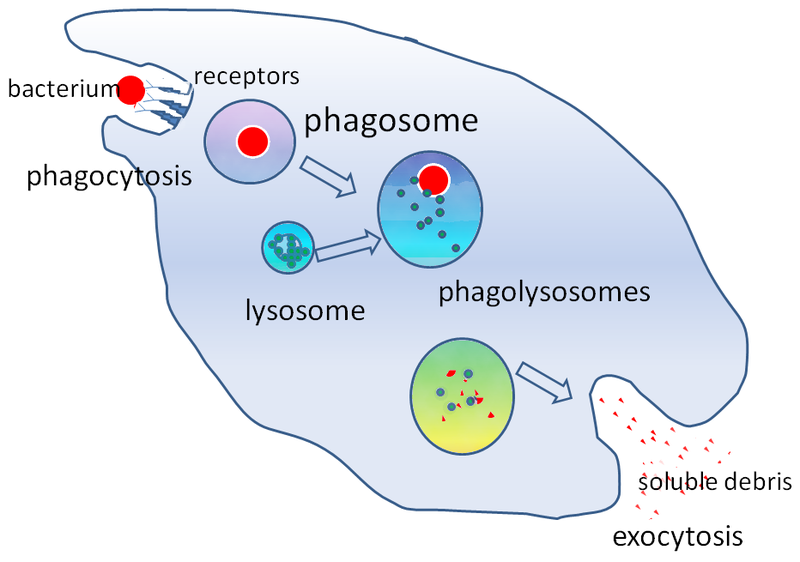 The phagosome then fuses with a lysosome to form a phagolysosome. Lysosomes contain digestive enzymes which can destroy the pathogen. The oxygen dependent pathway (oxidative burst) involves the generation of reactive oxygen species (ROS) such as the superoxide radical and hydrogen peroxide. These highly reactive radical molecules react with proteins, lipids and other biological molecules which effectively kills the pathogen. Superoxide radicals are initially produced (via the enzyme NADPH oxidase) and subsequently converted to hydrogen peroxide by the enzyme superoxide dismutase. Superoxide radicals can also react with the hydrogen peroxide to form powerful hydroxyl radicals which assist in killing the invading pathogen. The oxygen independent pathway involves the destruction of the pathogen via lysosomal enzymes such as proteases, phospholipases, nucleases and lysozyme. These enzymes help in destroying the pathogen primarily by breaking down its cell membrane. This a less effective mechanism when compared to the oxygen dependent pathway. Fig 3 – Diagram summarising the process of phagocytosis. This is a group of inherited diseases caused by a NADPH oxidase deficiency. NADPH oxidase is a key enzyme required to produce reactive oxygen species, particularly the superoxide radical. The result of this is ineffective phagocytosis, as patients are less able to phagocytose via the oxygen dependent pathway (oxidative burst). This leads to persistent inflammation and granuloma formation in many organs as well as persistent infections. Patients typically suffer from recurrent pneumonia, skin abscesses, arthritis and cellulitis and osteomyelitis. This is often picked up during childhood. Management is usually via antibiotic therapy and immunomodulation.